Q: I don't understand why you've giving different advice for guessing on verbal versus quant. Can you explain that to me? If you can narrow down the answers to a few choices, the odds are much more likely in your favor and guessing could be right. Never skip a question in quant and try to answer every single problem for the best score. It doesn't seem to make a significant difference in verbal whether one answers everything or leaves some blank, so spend your time trying to accurately answer what you can, but don't worry about not getting to everything. Again, even if it seems odd, this is based on research done by GMAC where they analyzed thousands of actual GMAT records!
. Timing strategies. In this video, we'll talk about the pace to keep. And various time management strategies you should employ when taking the GMAT. So, the first thing I'll say, is that time management is one of the many skills you need to master on the GMAT. It's in fact, one of the things that the GMAT is testing. If you think about it, what is the GMAT? The GMAT is to prepare you for business school. Business school is to prepare you to be a manager in the modern business world. If you're a manager in the modern business world, you have to make decisions in a very timely manner. In another words, things happen and the market reacts. And you have to act right then. There is time pressure. You can't say, oh, I'll wait a week and think about it. By the time you wait a week, the opportunity could be long passed. That's just the nature of the modern business world. So in much the same way, the GMAT is a test that tests your ability to handle time management and time management skills. So the first thing I'll say is, one of the biggest mistakes your could make in your GMAT studying is to think. First, I'll take my time doing problems as I learn the material. Then toward the end of my studying, I'll start to practice under time pressure. Wrong. Start right now. Practice every single GMAT problem against a time clock. Even if you're at the very beginning of your GMAT studies, start against the clock right away. If you can't solve a problem in the requisite time, you shouldn't give yourself any credit for it. This is very, very important. You have to build up your instincts for what it feels like to work under that time pressure. So that by the time you get to the GMAT, working under that time pressure is perfectly natural. On the IR section, you have about two minutes per page. And that's important. Often there's quite a bit to do on each page. So you need a good two minutes to handle it. 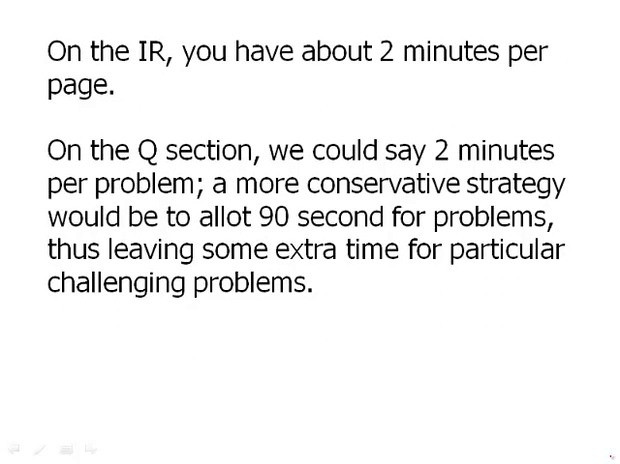 On the Quantitative section, we could say two minutes per problem. A more conservative strategy, would be to allot 90 seconds for a problem. And thus leave a little bit of extra time for particularly challenging problems. That might be overall a more successful strategy. On the Verbal section. Allow yourself 90 seconds for each critical reasoning question and each sentence correction question. Allot about 2.5 minutes for reading a short passage on the Reading Comprehension. About 3.5 minutes for a long passage. And about 60 seconds for each of the Reading Comprehension questions. And incidentally, when you're starting out, it's very useful to set a timer as you're doing this. 2.5 minutes or 3.5 minutes, that may seem relatively quick. But, when you realize, when you actually set the timer and realize, that allows you to read at a slow intelligent relaxed pace. Reading on the Reading Comprehension, is not about speed reading. It's about one careful, thorough reading of a passage. And you can do it in that time period. Part of what practicing with time pressure means, is that as you reach the time limit on a question. There may come a point at which you are out of time and have to give up. What do you do? Here, we need to distrut, we need to draw an important distinction in types of guessing. There are two different types of guessing that are very different. Type of guessing number one, is blind guessing. So this means, that any of the five answers could be correct. In other words, the question might as well be written in Sanskrit. You just have no idea. You have no way even to approach the question. Now, at the beginning of your GMAT study, you may feel this way about some questions. Once you've been studying for the GMAT for a while, it's unlikely that during the middle of the test. That you're gonna run into a question where you really just have no idea whatsoever. What's more likely, is the second type of guessing. And this is called solution behavior. You can eliminate one, two, or even three answers. But you can't determine which answer is correct. In this case, it is always mathematically in your favor to guess among the remaining choices. So random guessing in a blind guessing scenario, guessing for five answer choices. Mathematically, that does not move you ahead at all. But, if you could eliminate even just one answer and guessing randomly from the four. Or even better, you can eliminate two or three answers and guess randomly from the remaining answers. That is definitely to your advantage mathematically. And that, on average, will move you forward. So finally, we need to talk about what happens when you run out of time. So, even with the best pacing strategies, you can find that time slips away from you. Suddenly, you're at the end of the section, and you have a few minutes left to do five or six questions. What do you do when you have this mad rush at the end of a section? Very different, depending on whether you are on the quantitative section or the verbal section. On the quantitative section, do not leave anything blank. It's much better to guess randomly on the last couple, rather than leaving them blank. On the verbal section, just the opposite. An omitted question at the end of the section is no worse than a wrong answer. Take your time. Continue to do your very best on each question in front of you, until you run out of time. And it may be there are a few questions you never get to. So you never even see them, you wind up omitting them. That's perfectly fine on the verbal section. But do not do that on the quantitative section. Very important to keep track of the end game rules for the two different sections.